Your KaaS environment comes with two instances of Prometheus. One is preconfigured to monitor the Kubernetes cluster itself and the other to monitor your cloud-native applications. Rackspace does not recommend that you change anything in the Prometheus instance that monitors your Kubernetes cluster. As for the other Prometheus instance, you can use it to watch your applications, as well as set up Grafana dashboards to visualize Prometheus' data. If your organization already has a monitoring solution that you want to use to monitor your Kubernetes applications, contact your Rackspace representative to discuss implementation details. If you decide to use the Prometheus instance deployed by KaaS to monitor your applications, you need to configure all the required configuration files that specify how Prometheus Operator communicates with service monitors and Prometheus exporters. Prometheus provides exporters for the most commonly used applications, and many third-party vendors develop their own Prometheus exporters. The main functionality of an exporter is to provide an endpoint for Prometheus to scrape metrics from application services. At a high level, Prometheus sends an HTTPS request to the exporter. The exporter interrogates the application and provides metrics in the Prometheus format to its endpoint conforming to the Prometheus HTTP API. Because each application is different, there is no solution that fits all use cases. Therefore, you need to define unique configuration files and select appropriate exporters for each application. Create a deployment and service configuration file for your application. Expose an application-specific Prometheus exporter endpoint. Create a service monitor in Kubernetes that defines how Prometheus polls the exporter for data. Configure Grafana notifications and dashboards. As an example, deploy a MySQL database with Prometheus monitoring. You can use the MySQL Prometheus exporter called mysqld_exporter to expose MySQL metrics to Prometheus. A PersistentVolumeClaim for the MySQL database. The Prometheus Operator deployed by KaaS searches for the monitor-app label in the service monitor configuration files. If the label is different from that, KaaS can still deploy the application, but Prometheus will not be able to discover it. Therefore, create the service monitor in the monitoring namespace and use the monitor-app label as shown in the .yaml file below. Log in to the KaaS Control Panel and then to the Prometheus UI. Go to Status > Targets. Go to the Grafana dashboard. Import or create a dashboard to monitor your MySQL database. In the prometheus field, select prometheus-customer as a source. 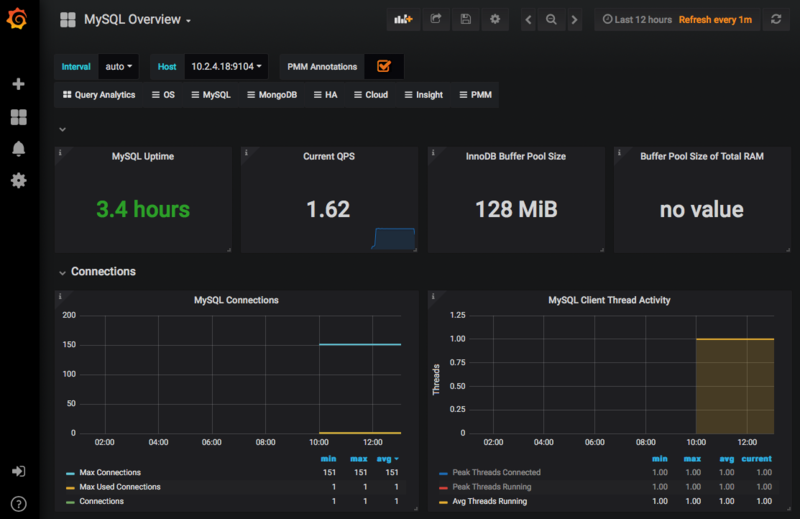 In the screenshot below the MySQL Overview Grafana dashboard is used as an example. Verify that you use the monitor-app label for the service monitor and that the service monitor is deployed in the monitoring namespace. time="2018-10-12T16:39:22Z" level=info msg="Starting mysqld_exporter (version=0.11.0, branch=HEAD, revision=5d7179615695a61ecc3b5bf90a2a7c76a9592cdd)" source="mysqld_exporter.go:206"
time="2018-10-12T16:39:22Z" level=info msg="Build context (go=go1.10.3, user=root@3d3ff666b0e4, date=20180629-15:00:35)" source="mysqld_exporter.go:207"
time="2018-10-12T16:39:22Z" level=info msg="Enabled scrapers:" source="mysqld_exporter.go:218"
time="2018-10-12T16:39:22Z" level=info msg=" --collect.global_variables" source="mysqld_exporter.go:222"
time="2018-10-12T16:39:22Z" level=info msg=" --collect.slave_status" source="mysqld_exporter.go:222"
time="2018-10-12T16:39:22Z" level=info msg=" --collect.info_schema.tables" source="mysqld_exporter.go:222"
time="2018-10-12T16:39:22Z" level=info msg=" --collect.global_status" source="mysqld_exporter.go:222"
time="2018-10-12T16:39:22Z" level=info msg="Listening on :9104" source="mysqld_exporter.go:232"